Ticks are thought of as insects, they are actually arachnids the same as scorpions, spiders and mites. All ticks have four pairs of legs (eight legs in total) as adults and have no antennae. Adult insects by comparison have three pairs of legs (six legs) and one pair of antennae. Ticks feed on the blood from their host, which can be an animal or a human. Ticks are efficient carriers of disease because they attach firmly when sucking blood, feed slowly and may go unnoticed for a considerable time while feeding. Ticks take several days to complete feeding. 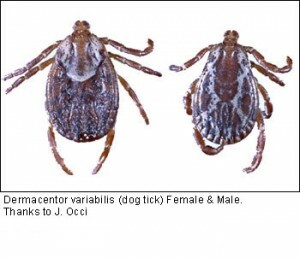 I am sure you know about flea and tick medications like Frontline and K9 Advantix, you may be shocked just how much you don’t know about protecting your dog from ticks. Every dog should be treated with a flea and tick preventive but there are other things you should also do to keep your dog protected. The ingredient that makes both Frontline Plus™ and Advantix™ effective on ticks is premethrin. Be very careful if you have cats in your home, as premethrin can be fatal to cats, whether inadvertently given or even by exposed to a recently treated dog. Treatments are effective for up to one month. These products don’t prevent ticks from getting in your dog’s fur, so it’s always a good idea to inspect your dog using a brush, after being outdoors. No vaccine is 100% effective and ticks are capable of carrying a variety of diseases other than Lyme disease. There used to be a vaccine that prevented Lyme disease, but the manufacturer stopped manufacturing it in 2002 because there was not enough demand for it. Just because you’re treating your dog for heart worms and other regularly given vaccines from your vet does not mean you are treating your dog for ticks. Contact your Veterinarian, or discuss it with them on one of your visits early in the year to make sure what you treat your loved one for. Adult ticks can be active all year around, if the weather raises above freezing. If there is snow on the ground, there won’t be much tick activity, if there are several warm winter days in a row, the ticks may be active. So examine your dog carefully and talk to your Veterinarian.